This mosaic style vase can hold a sunny bunch of sunflowers or you can use the flowers separately with their individual leaves. The tag adds a charming touch. Matching template and masks makes coloring and decorative painting easy. Vase measures approximately 2" X 2-1/2". Largest Sunflower measures approximately 2-3/4" X 2-3/4". 7 pcs. This quality cling-mount rubber stamp set is made from deeply etched, precision trimmed premium grey rubber. With 1/8 inch thick grey foam for a smooth impression on uneven or textured surfaces, it is backed with a full sized index of the image. The index allows for precise placement of the image when used with a clear acrylic handle. The image features original artwork designed by and Copyright 2016 Fran Seiford. Made in China. 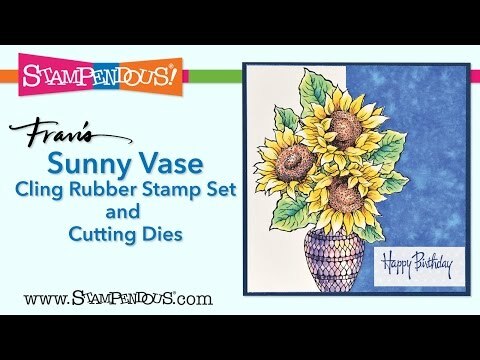 Cling Sunny Vase Rubber Stamp Set was added to your cart.